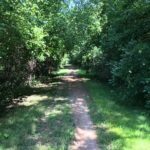 An article by Janine Copple Comments Off on Trail Ramblings: Riding Around The Rain. It’s difficult to know just when it’s going to rain, so either you have to be prepared for it or not worry about getting wet. 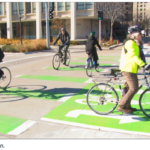 Where to ride is a consideration, however. If you’re commuting in it, you probably already know where to avoid or have your alternate rain route, if necessary. 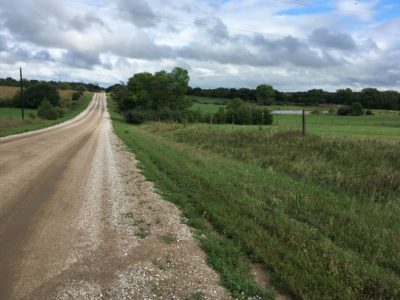 I decided to do a sort of trail survey of some segments I hadn’t ridden in a while, partly so that if it started to rain again I wouldn’t be that far from home, and I could run some errands a the same time. It was all hard-surface. I ended up with over 50 miles and it was by no means a comprehensive survey, so if you think you can’t get miles in riding urban trails and side-paths, it’s not so. 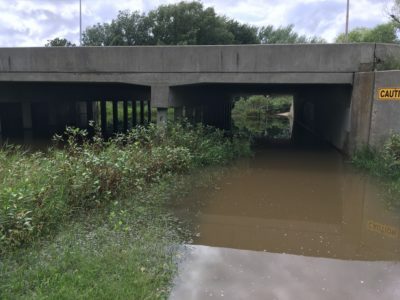 Not all underpasses and low areas flood the same every time, with the possible exception of Billy Wolff and at 70th St. The underpass Monday, before the rest of the rain. 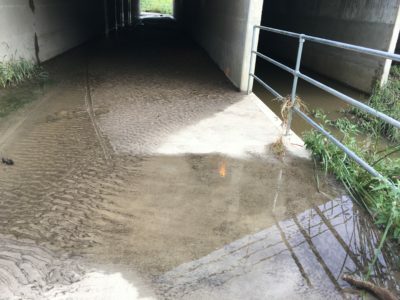 If you ride under 84th and under Old Cheney on the Billy Wolff, you know when to hazard it and when to go around, like now. 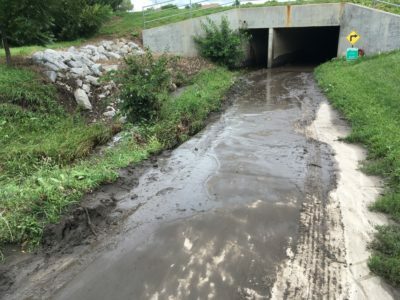 The 84th street underpass will eventually get cleaned out, but it can take a while. If we get a large amount of rain in a short amount of time, water can go over the trail next to the zoo. The problem is that you don’t know it until you’re committed to taking that segment. You either have to go through it, a tricky prospect because the depth varies at different places, or turn around and go back, wasting time. I’ll admit to going through it when I probably shouldn’t have. 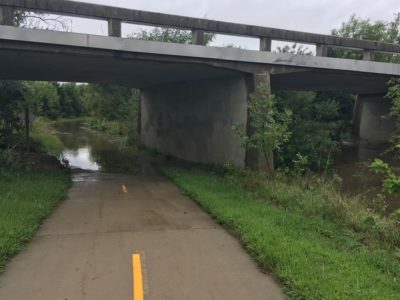 I wish there were a marker of some sort at each end of the segment from A Street to near 27th St. You could see that when the water is up this high on the marker it’s over the trail by this much. Monday under S. 56th St.
Another underpass that was passable today, but only just, was the new one on 56th St. south of Highway 2. The approach to that from the east still has an unfinished look, with weeds encroaching. You might think that’s only an issue with appearance, but it’s not so. Soon after our return from China I was riding down the Mopac with probably 40 pounds of groceries. Loaded bicycles handle somewhat differently and I got a little too close to the edge of the trail, which was obscured by low-growing weeds. My tire caught the edge and down I went, leaving me with some nasty road rash on one knee, right through my pants. 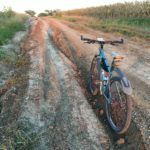 As far as what surface to ride, I suspect that the gravel and limestone is all going to be saturated for a while, meaning the Nacho ride will be on the highway shoulder or a slog through the bog that is the trail. Today I had a job that necessitated taking some gravel and it wasn’t too bad. The riders on the trail ride last Saturday to Beatrice got lucky to still have a dry trail. 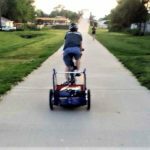 We had planned to ride the Steamboat trace trail and do some bikepacking this holiday, but scratched those plans with the rainy forecast, though I read a report it was fine still at that time. The last time I rode that trail was after a rain, pulling a trailer with a dog, and it was a slog. Doable but not as much fun as it should have been. Don’t let this weather stop you, though. The wild plums are ripening, so you shouldn’t miss it. Just be prepared.